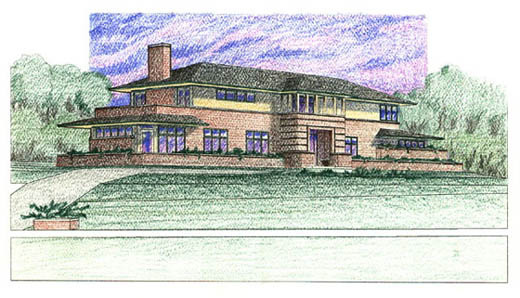 This custom house was designed by an architecture firm called Architectura, located in suburban Chicago, in the Prairie School style of Frank Lloyd Wright. 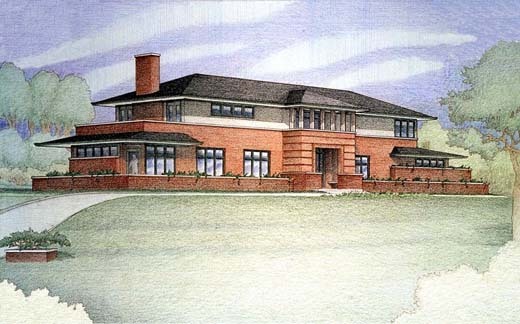 Randal was asked to render the home for the architect to better enable his client to visualize how the design would look when completed. Randal did the wireframe line work in a 3D software and then transferred it to 2D drawing programs and printed the linework on various types of sketch and drawing paper. He first did a series of quick color studies like the one shown below, to work out the final values and color palette. Sometimes the early sketches and studies have a unique quality of their own.